Should Uncle Sam Subsidize Wages? Washington is a place that gets infatuated with trendy ideas. A few years ago, everyone was talking about a “universal basic income” because of the strange assumption that millions of people will be unemployable in the future. That idea was mostly embraced by folks on the left (though not Joe Biden), but there’s now a related idea on the right to provide “wage subsidies” so that unemployable (or difficult to employ) people can get work. A leading proponent is Oren Cass of the Manhattan Institute, who wrote The Once and Future Worker: A Vision for the Renewal of Work in America. National Review published an excerpt from his book. Work has enormous social value for the individuals who engage in it and for the formation and stability of their families, the opportunities of their children, and the vibrancy of their communities. Ideally, the labor market would settle in a place where productive, family-supporting work was available to all people in all places. But nothing in the theory of economics guarantees such an outcome… If we really want to “pay for jobs” — and we should — then we should do it directly. …a…“Federal Work Bonus,”…an additional $3 into your check for every hour worked? That would be a wage subsidy. …a wage subsidy aims to produce that effect in the labor market. Workers unwilling to sell their labor for less than $12 per hour may be worth only $9 per hour to an employer. No job will emerge in that scenario. With the insertion of a $3-per-hour wage subsidy, by contrast, the employer can pay the $9 per hour that the work is worth and the worker can receive the $12 per hour that he demanded. Thus will appear a job where none existed before. …The value of the subsidy would be set relative to a “target wage” of, say, $15 per hour and would close half the gap between the market wage and the target. A worker would initially receive a subsidy of $3 per hour in this case, equal to approximately $6,000 per year if he worked full-time. The wage subsidy Cass advocates is similar to the “earned income tax credit,” which is basically a redistribution program that is administered through the tax code. But Cass wants the EITC to be universally available rather than primarily targeted at households with children. The federal earned income-tax credit (EITC) already operates something like a wage subsidy, offering low-income households large tax refunds that can exceed what they paid in taxes to begin with. But the EITC gets paid long after the income is earned — at tax time the following year — based on an opaque formula. It creates none of a wage subsidy’s immediate, transparent effect in the labor market. 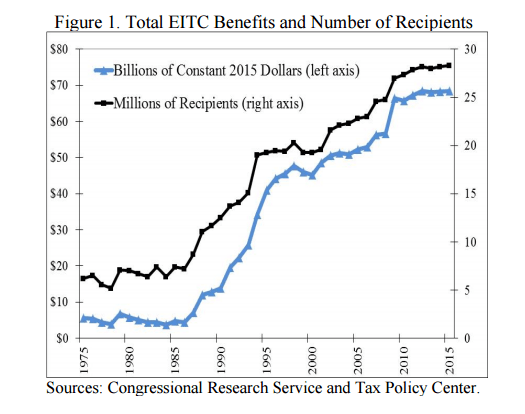 …The EITC also skews its benefits heavily toward households with children. A single person working full-time at minimum wage would get a credit of $41, less than 1 percent of what his colleague with kids can expect. For what it’s worth, Cass acknowledges that employers might capture some of the benefits of a wage subsidy. If the government offers a $3 subsidy atop a $9-per-hour job, the result will not necessarily be a $12-per-hour job. The employer might instead cut the market wage to $8, to which the government would add $3.50 — half the $7 gap to the target wage of $15 — leaving the worker with $11.50. …How workers and employers respond to the subsidy will vary based on labor-market conditions. What we do know from studies of the EITC and a similar program in the United Kingdom is that, in those instances, roughly 75 percent of the financial benefit accrued to workers. Now let’s discuss the policy implications. Cass openly admits that a wage subsidy is a form of redistribution, and – much to my dismay – he doesn’t object if at least some of that new spending is financed by higher taxes. Subsidizing wages is a particularly well-tailored response to the challenges that globalization presents for American workers. First, the wage subsidy is the appropriate mechanism for redistributing gains from the economy’s “winners” to its “losers.” It comes closest to doing this directly, by taking tax revenue drawn from higher earners and inserting it directly into the paychecks of lower earners. …it is redistribution. And yes, high-income taxpayers will finance it. …The roughly $200 billion price tag for a wage subsidy might require some new tax revenue, but its funding could come largely from the existing safety net, which already dedicates more than $1 trillion annually to low-income households — including many with workers. The following excerpt also rubbed me the wrong way since he seems to be saying that it would be better if Washington had expanded redistribution instead of lowering the corporate tax rate. …in debates over the 2017 tax-reform package, which ultimately increased the ten-year federal deficit by $1.5 trillion for the sake of reducing the corporate tax rate, while failing to deliver even the small EITC increase for childless workers that Ryan had once championed. Indeed, while the Khanna proposal in its 2017 form is not a serious one, even it could have been implemented more cheaply than the tax reform that ultimately passed. The deficit spending would have been equally costly, but at least the labor market and its low-wage workers would have been the chief beneficiaries. …the Republican party’s relative disinterest in the labor market is made apparent by its preference for a tax cut over a wage subsidy. This is very troubling. In the long run, faster growth is much better for low-income workers. I’m not the only skeptic of this plan. Writing for the Week, AEI’s Jame Pethokoukis argues that Cass bases his idea on a misreading of the economy. One of his innovative analytical insights is that economic growth from globalization is bad for workers. …This is a terrible reading of history… America would be worse off today if it had somehow kept the closed “golden age” economy of the 1950s and 1960s. Its lack of openness greatly harmed American workers… Too much of American industry became complacent, unproductive… Likewise, would America have a more thriving economy today without Silicon Valley? …Cass’ reading of the data isn’t much better as he adopts the stance of many leftists that most Americans are no better off than decades ago. Yet a recent Congressional Budget Office study shows a nearly 50 percent increase in middle-class incomes since 1970, with incomes for the bottom fifth up some 80 percent. And Michael Strain, also with the American Enterprise Institute, was similarly critical in a column for Bloomberg. Economic growth is under attack. Or, more specifically, the idea that public policy should place a large amount of emphasis on the economy’s rate of growth is under assault… Traditionally, conservatives have placed a premium on growth as the best way to advance the fortunes of all Americans. But in recent years, some on the right have [been] playing down the importance of growth to the well-being of many working-class Americans. The latest argument for that position comes from Oren Cass… Cass argues that the results from decades of policies designed to encourage GDP growth are “embarrassing” and have “steered the nation off course.” …conservatives have been right in their traditional focus on growth. Let’s recall why. …the hot U.S. economy is the best jobs program available for lower-wage and vulnerable workers. …this strength is benefiting low-wage workers more than other groups. …Growth doesn’t just help low-income and working-class households in the short term. Over longer periods, seemingly small changes in the growth rate have large consequences. In the past four decades, for example, real GDP per person has increased from about $28,000 to over $55,000, growing at about 1.7 percent per year. If growth instead had been 1 percent, average GDP per head would be about three-quarters what it is today. Needless to say, I strongly agree with Strain’s final point about the importance of faster growth. Though I confess to being at a disadvantage when judging these anti-Cass columns since I haven’t read the book. However, to the degree that Cass truly has given up on growth (i.e., accepting some form of the “secular stagnation” hypothesis), then I side with Pethokoukis and Strain. But that’s not my main concern. Here are the four reasons that motivate my objection to wage subsidies. Redistribution should not be a responsibility of the federal government. Indeed, I want all redistribution devolved to state and local governments (or to the private sector). Cass says the program will cost $200 billion. Like with most government programs, I assume the actual fiscal burden will wind up being much higher. Especially after the left starts a bidding war. Existing wages subsidies are riddled with fraud because the government effectively gives people lots of money simply for filing a tax return, yet rarely bothers to confirm they actually earned the income. Wage subsidies actually turn into wage penalties (i.e., punitive implicit marginal tax rates) when income rises above the target level and the handouts are withdrawn. The bottom line is that Cass is right that it’s better to subsidize work rather than idleness. However, Americans already are too dependent on Uncle Sam. It would be even better if we simply achieved more growth by adopting the tried-and-tested recipe for prosperity.